Match-up zone is a "combination" defense, combining elements of man-to-man defense (on ball), and zone defense (away from the ball). This is a zone defense that acts a lot like a good man-to-man defense. The on-ball defender closes-out and plays tight like in a man-to-man. The zone away from the ball resembles man-to-man "help-side" defense. Be sure to see the animation (which is much more detailed) and also this page: Complete 1-3-1 Match-up Zone". A good man-to-man defense looks like a zone away from the ball (help-side defense)... see Basic Defense. The match-up zone resembles what we years ago called a "switching man-to-man", where defenders switch freely with one another, so that your defensive big men stay down low and your quick guards are on the perimeter. This discussion also reminds us that "a good zone looks like a man-to-man, and a good man-to-man looks like a zone." An advantage of the match-up defense is that it may confuse the opponent in trying to figure out what defense you are actually playing. Also, it may dictate or affect the offense's basic set and get them out of their usual comfortable set. With the match-up, you can show a 2-1-2 formation, which may force the offense to go with a 1-3-1 or a 3-out, 2-in set. If you show a 1-3-1 or a 1-2-2 match-up zone, the offense may change to a 2-1-2, or 2-3 set. So you may be able to put them into something they are less comfortable with. As in any aggressive man-to-man defense, pressure the ball at all times, front the low post, deny the passing lanes, and give help on inside penetration. 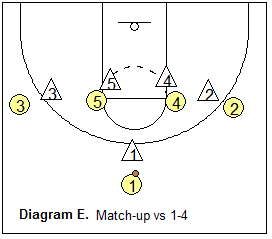 Now let's look at some defensive sets and how to match-up. You can create your own match-up rules so long as your players all understand and know the coverage patterns. In the diagrams below X = defense, O = offense. 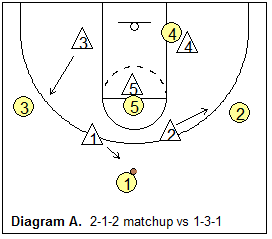 The 2-1-2 match-up zone faces a 3-out, 2-in offensive set. The coverage pattern is identical to that in Diagram A, except that X5 will drop down to the low block and pick up O5. 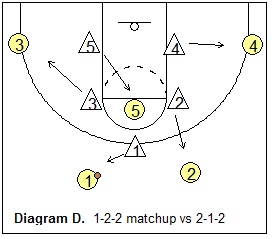 One guard defensive front match up zone (1-3-1 and 1-2-2 sets). By using either the 1-3-1 or 1-2-2 set, you may be able to force the offense out of their usual 1-3-1, or 3-out, 2-in offense and into a 2-1-2 set. Refer to Diagram C. (1-3-1 match-up zone vs 2-1-2 offense) X1 picks up the guard to his right and X2 gets the other guard. 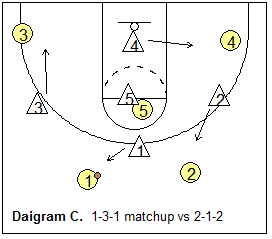 X3 drops down to get the player in his/her corner and X4 gets the opposite corner. X5 has the middle. 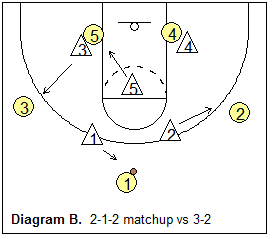 Refer to Diagram D. (1-2-2 match-up zone vs 2-1-2 offense) Again X1 and X2 pick up the two guards (O1 and O2) and X3 gets the wing-corner (O3) on his side. X4 picks up the opposite corner (O4) and X5 moves up to defend the high post (O5). Here's how to match up against the 1-4 stack offense. X2 should play the gap between O2 and O4, and X3 plays the gap between O3 and O5. Both of these defenders can try to deny the pass to the wing and help when the ball gets to the post player at the elbow. 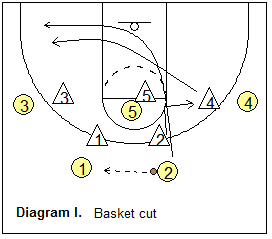 If X2 (or X3) gets beaten by the back-cut, then X4 (or X5) must recognize this and pick up the cutter, while X2 (or X3) slides over to pick up the post player (O4 or O5) that was vacated by the switch. 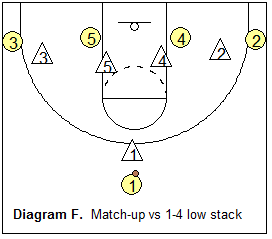 Here's how to match up against the 1-4 low stack offense. X2 should again play the gap between O2 and O4, and X3 plays the gap between O3 and O5. Both X2 and X3 can attempt to deny the pass to the two offensive players they are gapping. X4 and X5 three-quarter front the two low post players. X1 plays good man-to-man defense against the point guard (O1). Look at Diagrams G and H below. How are you going to defend these cuts? You must have a solution for defending these offensive cuts. In Diagram G, when the cutter (O2) moves away from the ball (to the weak-side), X2 can stay with and bump the cutter, and deny the pass, and then switch with X4 once O2 moves to the corner. Now X2 has O4 and X4 has O2. In Diagram H, this is a more threatening situation with the cutter moving ball-side. Here it might be easiest just to have X2 stay with O2 man-to-man all the way to the ball-side corner. Alternately (diagram I), when O2 passes to O1, X4 should be dropping inside. So you could have X4 pick up the cutter O2 and go with him/her out to the opposite corner, while X2 then takes O4. However you do it, you must have a solution for these cuts, and must drill them thoroughly in practice so everyone understands what to do. The other option, which is even more simple, is to have just one rule... once the initial match-ups are done (on that particular offensive possession by the opponent) and you have affected the offense's basic set, everyone plays man-to-man, using the concepts of on-ball, deny and help-side defense (see Man-to-Man Pressure Defense). 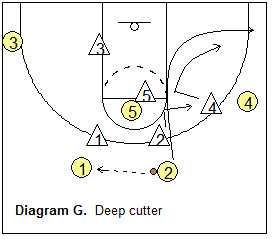 Now, go to this page for a complete 1-3-1 match-up zone, with all the details regarding how to rotate and defend cutters, handle screens, hi-lo, flash cuts, etc. This will help you decide how you want to handle these various situations.